The last post laid out the basic idea – all you have to do is change your Thrift Savings Plan fund allocation at each of the change points in the business cycle in order to maximize your return. There are hundreds of economists studying the business or economic cycle every day, so we must know where we are at any given time, right? And then all we have to do is invest in our Thrift Savings Plan based on where the authorities tell us we are, right? As it turns out, it is not as simple as that. The strength of what we are doing is that we know what is coming next. The hard part is figuring out when we are at that turning point, and distinguishing a blip from a full blown recession. The way we try to do that is by looking at a combination of economic indicators. Any one of which, or even any aggregation of indicators, can point us in the wrong direction, so we look at a wide variety and we look at three types of indicators – leading (which attempt to forecast the future), coincident (which measure where we are right now), and trailing (which tells us where we were). (3) the stock market: the market generally anticipates movements in the economy – in recessions profits and earnings are down so stock prices should fall as soon as a recession is anticipated by the market. 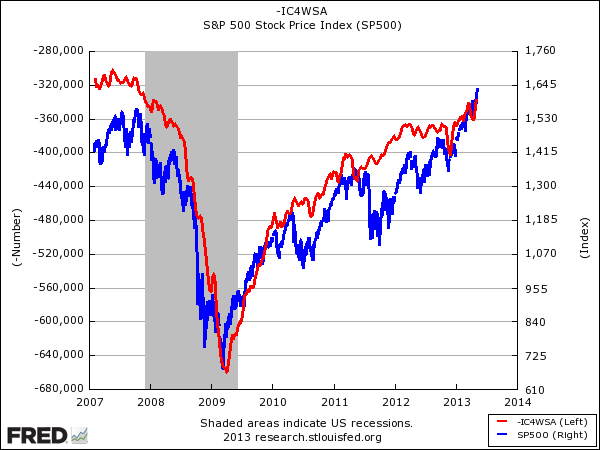 Every post-World War II downturn in the economy has been at least matched, if not anticipated, by the stock market. The problem is that there have been several downturns in the stock market which didn’t turn into recessions (the October 1987 crash, for example, which was followed by several years of continued growth). 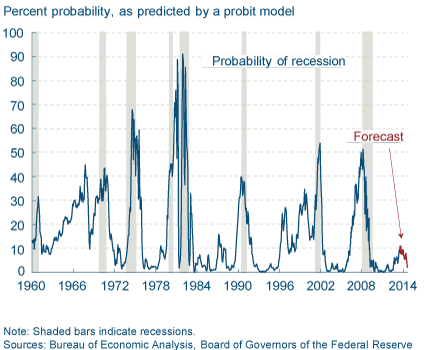 There is a joke among economists that the stock market has correctly predicted twelve of the last eight recessions. have been useful in predicting downturns in the economy historically, but actions taken by the Federal Reserve to artificially hold interest rates low for extended periods of time (as it is currently doing) can throw the predictive value of these spreads into doubt. The Federal Reserve Bank of New York published an article which explains this much better than I ever can: The Yield Curve as a Predictor of U.S. Recessions. 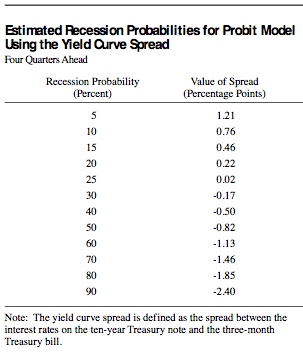 The following graphic nicely demonstrates the historical utility of the yield curve in predicting recessions. Note how the sharp upward spikes in the yield curve were predictably followed by recessionary periods. (5) Purchasing Managers’ Index (PMI): monthly surveys of private sector companies which measure both sentiment and hard numbers. The numbers generated by the indexes are important to me, but perhaps more important for projecting are the trends indicated by comparing the current numbers to those from past months. These numbers come from the Institute for Supply Management. I track upcoming releases of economic data and detailed results through the Econoday Calendar. For a quicker snapshot I go to MarketWatch’s Economic Calendar.